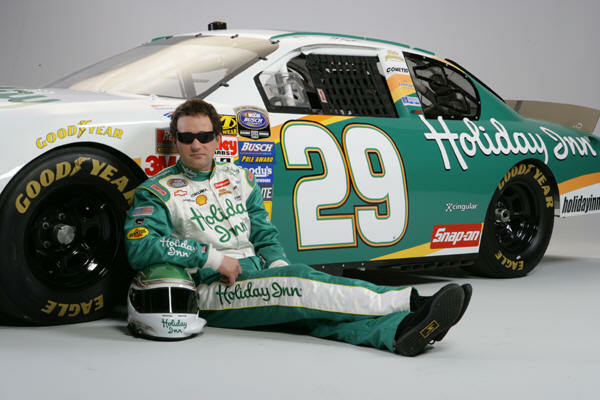 Scott Wimmer will enter his second season with Richard Childress Racing in 2008 and run a partial Busch (23 Races) in the #29 Holiday Inn Chevy. The team has set its sites to repeat the owners championship that it claimed in 2007. Wimmer, a Wausau, Wis., native, has found success in every series he has ever competed in. He carved his mark on the short tracks around Wisconsin throughout the 1990’s and became recognized as a dominant force in racing around the Midwest, winning 17 times and claiming local and regional championships in a late model stock car between 1994 and 1996 before moving to Hooter’s Pro Cup Series. But, Wimmer really caught the eye of top NASCAR owners after he entered the American Speed Association (ASA) and claimed victories in the first two races he competed in. Wimmer tallied up two top five and eight top 10 finishes in his rookie year of the Busch Series that put him 11th in the championship standings. 2002 brought hopes of a Busch Series Championship. Wimmer posted strong finishes in the early part of the season, but hit his stride during the summer months when he posted four consecutive top-10 finishes in June. Wimmer scored his first Busch Series career win at the fall Dover race, and in the final seven races of the season posted wins at Memphis, Phoenix and Homestead. Wimmer finished the season up with four wins, 11 top five and 17 top 10 finishes and a career high third in the championship standings. 1984 - 1985: Started racing three-wheelers in 1984 and in 1985, finished second in the National Amateur Off-Road Championship. 1991 - 1993: Started racing stock cars at age 15 at Wausau Speedway in 1991. Competed there two more seasons until started traveling in 1994. 1994 - 1996: Raced at Various tracks in Wisconsin. Won Rookie of the year at State Park Speedway, Dells Motor Speedway and WI Short Track Series in 1994. Won Driver of Tomorrow at State Park Speedway. Finished second in points at Dells Motor Speedway in both 1994 and 1995. Overall Champion County Time Series at Slinger/Madison Speedway in 1995. Finished second in points at Dells Motor Speedway in 1995. Points Champion, Miller Triple Crown Champion and finished second in the Budweiser Triple Crown at Dells Motor Speedway in 1996. 1997: Competed in the Hooters late-model series. Won Hooter’s late model rookie of the year. Finished seventh overall in Hooter’s Cup late-model series. 1998: Competed in Hooters Pro Cup Series full-time. Won Rookie of the year title, finished seventh in final point standings. 1999: Won two Hooters Pro Cup Series races at Langley Speedway and Lakeland Speedway. Finished 11th overall in Hooter’s Pro Cup final point standings. 2000: Competed full-time in the American Speed Association (ASA). Won the first two races that he entered that season in at Lanier Speedway and Hickory Motor Speedway. 2001: Competed in his first full-time season of NASCAR Busch Series competition. Logged two top-five and eight top-10 finishes. Finished 11th in the final point standings. 2002: Competed in his sophomore season of NASCAR Busch Series competition. Scored four wins at Dover (fall), Memphis, Phoenix and Homestead. Finished career high third in the final point standings. 2003: Third full season in the NASCAR Busch Series, scoring one win (Pikes Peak), four top five and 12 top10 finishes. Finished ninth in the final point standings. Pulled double duty for the remaining four races after being named the full time driver of the #22 Caterpillar Dodge. Scored first Winston Cup top 10 at Phoenix, finishing ninth.